Is McDonald’s CBO The Next Legend? On Thursday January 29th a group of McDonald’s Canada super-fans arrived at 2nd Floor Events on King Street West for the company’s first ever Flavour Session. The details of the evening were a mystery for those 35 hungry tummies. Their common bond: an enthusiastic love for the Golden Arches. Each VIP on the guest list had been vouched for by McD’s social media team after detailed listening and regular interactions on Twitter. It was through this social conversation that McDonald’s pin-pointed their most vocal supporters in Canada’s little city on the lake, inviting the group to a top secret event. One can’t help but indulge in a mystery! Upon arrival guests swooned over an old vintage cinema sign which read “The Next Legend,” and spent the following hour mingling by a pop up bar. At 7pm Chuck Coolen, McDonald’s Canada’s Senior Manager of Regional Marketing for Ontario revealed the company’s secret. At the mention of CBO (Chicken, Bacon, Onion) curtains rose and a DJ began to spin playful beats. Guests were wide eyed at the unveiling of a massive CBO inspired cake, snapping pictures before tucking into chairs around an intimate dining table. Candles flickered as ten McD’s crew members performed as creme de la creme waitstaff. 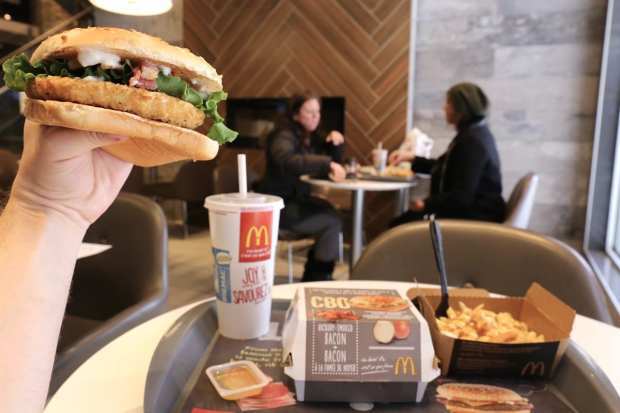 The CBO is the first new permanent sandwich offering to grace the McDonald’s Canada menu in over 5 years. The sandwich’s history dates back to 2008 when it first launched in France. After researching Canadian tastes the McD’s team created its own unique offering for the land of red, white and maple. The CBO has been dubbed #TheNextLegend and was purportedly crafted by the god’s above. McDonald’s Canada is pretty sure they have crafted a new icon which they are placing on a pedestal alongside the Big Mac and McFlurry. Yesterday much of Southern Ontario was hit by a boisterous blizzard. I shoved my mittens into my pockets and wrapped a scarf around my neck before marching down Yonge Street. I narrowly avoided a nose dive into a fluffy snowbank before spilling into the McDonald’s which sits perched across Gerrard Street. I took a deep breath, rubbed my cold fingers together and plopped myself onto a bench by the window across from a crackling faux fireplace. I endured a chilly trek that morning to sample the freshly launched CBO which I paired with a “wish I was still in Quebec City poutine.” The CBO is a mammoth sized sandwich offering savoury fans of the crunch n’ munch a perfect harmony of crispy seasoned chicken breast, crunchy onion crisps and hickory-smoked bacon. The sandwich is finessed with lettuce leaf, slathered with creamy onion and black pepper sauce and served on a toasted artisan-style sesame and onion bun. After munching through half of the burger I peeled back a honey packet and doused her in sweet bee revelry. Burgers dipped in honey, my very own McDonald’s secret since I was a wee one. My affinity for sweet meets savoury left my mug smug as I waddled home toasty warm in the height of Toronto’s epic winter wonderland. The funniest part is that I was just watching “The Adventures of Ronald McDonald: McTreasure Island” the other night. Ah well, guess I’ll just have to try harder!